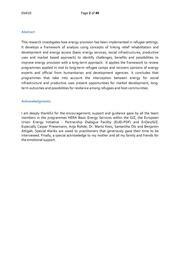 English: This research investigates how energy provision has been implemented in refugee settings. It develops a framework of analysis using concepts of linking relief rehabilitation and development and energy access (basic energy services, social infrastructures, productive uses and market based approach) to identify challenges, benefits and possibilities to improve energy provision with a long-term approach. It applies the framework to review programmes applied in mid to long-term refugee camps and recovers opinions of energy experts and official from humanitarian and development agencies. 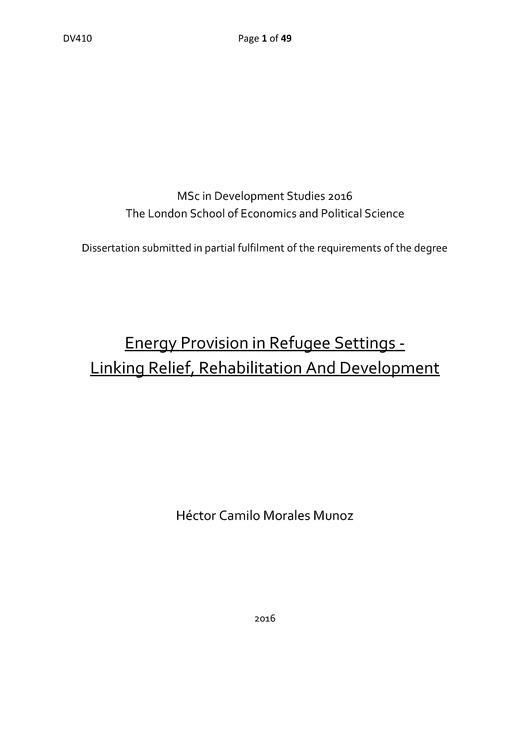 It concludes that programmes that take into account the interception between energy for social infrastructure and productive uses present opportunities for market development, long-term outcomes and possibilities for resilience among refugees and host communities. This page was last modified on 13 December 2017, at 11:46. This page has been accessed 7,245 times.